A “Wee” Outlander Recap Show, hosted by the award-winning Marlise Boland and Elyse Ashton, where we dish about the groundbreaking Starz hit series, OUTLANDER – based on the novels by Diana Gabaldon – and starring Sam Heughan and Caitriona Balfe. OutlandDish has included special guest interviews, fun fan giveaways and the occasional wee dram of whiskey! Marlise and Elyse’s unique brand and comedic approach to the recap has audiences around the world clamoring for more! Even the producers of the hit BBC series, Poldark are such huge fans of all their ‘dish’ shows that they invited our “Cornwall Cougars” to APPEAR on the show in Season 3! We hope you enjoy OutlandDish! Sláinte! Join us for our Scottish cèilidh! NEARLY ONE MILLION VIEWS STRONG! THANK YOU OUTLANDER FANMILY!! 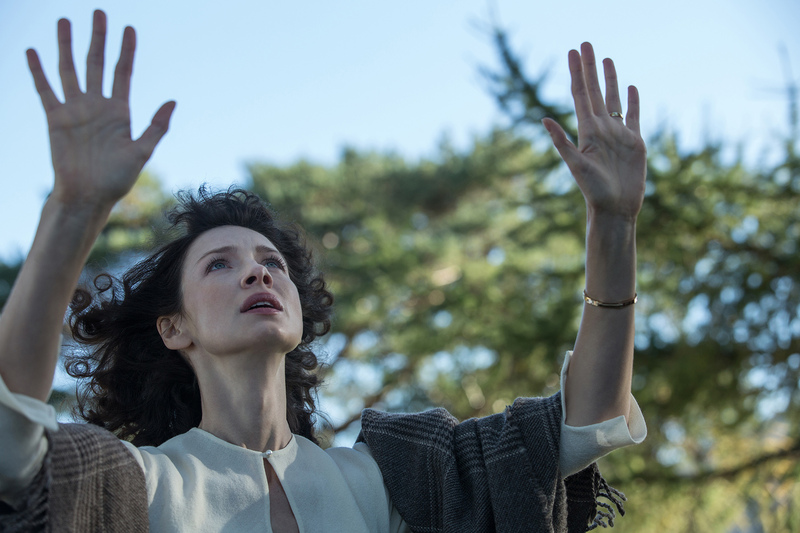 OUTLANDER RETURNS TO 2017 SAN DIEGO COMIC-CON! Starz gave Outlander fans a really cool experience at SDCC17. Take a look! The Award-Winning Dish Girls Are Back! 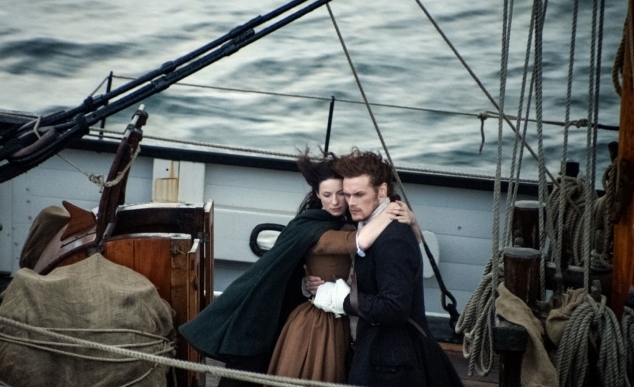 Season Two of “Outlander” begins as Claire and Jamie arrive in France! *Note: Our episode access was a wee bit different with Season 2 than we enjoyed previously and therefore we were unable to recap a new episode each week – like we do with other shows. We hope you liked this recap of the Paris episodes, which helped to secure us a nomination for Best Broadcast Critics by the LA Press Club! In response to the THOUSANDS of emails, tweets and DM’s we’ve received from the Outlander Fanmily – we WILL be back for Season 3! Prior to that we’ll do a MEGA recap of the whole of Season 2! We will do our best to release a new S3 episode each week. The Outlander fan support has been incredible and we thank you all for watching our wacky wee recap show! Sláinte!! 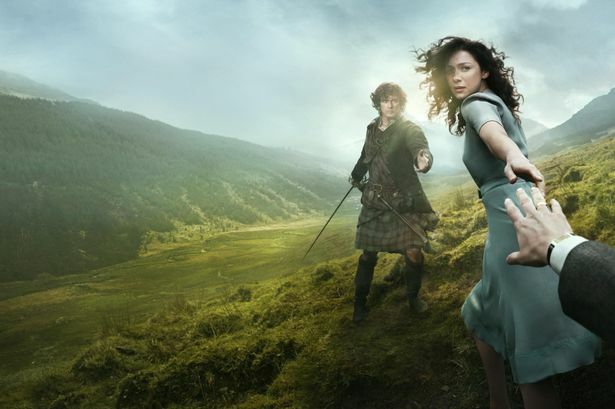 In Season Two Jamie and Claire are hell-bent on infiltrating the Jacobite rebellion led by Prince Charles Stuart, and stopping the battle of Culloden. With the help of his cousin Jared, a local wine merchant, Jamie and Claire are thrown into the lavish world of French society, where intrigue and parties are abundant, but political gain proves far less fruitful. Altering the course of history presents challenges that begin to weigh on the very fabric of their relationship. However, armed with the knowledge of what lies ahead, Claire and Jamie must race to prevent a doomed Highland uprising, and the extinction of Scottish life as they know it. The Red Dress! Jamie say’s she needs to cover the GIRLS! Don’t tell Jamie…Black Jack is Back! Black Jack is Back! Ugh! Does he have to be? 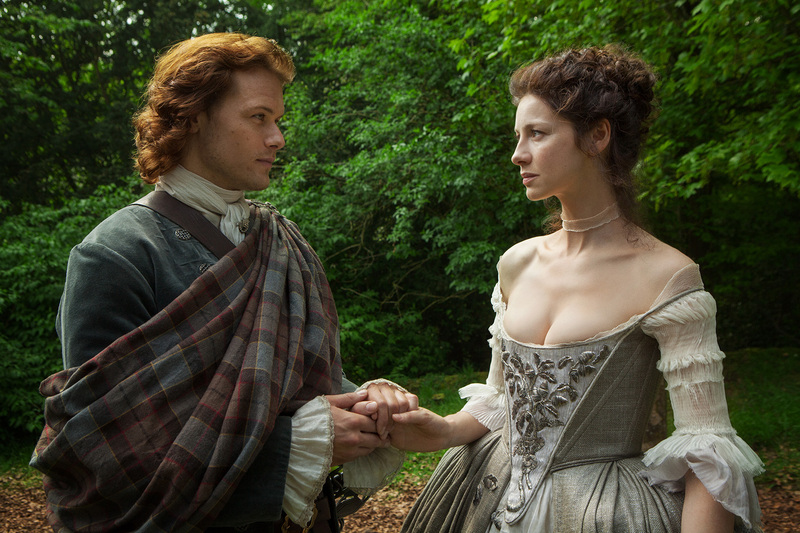 Thank You for a quarter of a MILLION views on our Outlander-themed content! Thank You to the Outlander Fanmily who have given us over a HALF MILLION views on our Outlander content! We look forward to Season Two! We’ve listed our episodes in REVERSE order beginning with the finale. (We feel we got funnier as the season went on.) Scroll down and travel up to watch in order. Our bonus interviews are also posted at the bottom of this page! Grab a wee dram and Enjoy! Jamie is freed following a daring rescue, but his mind lingers on the torture he endured. Thank You To Walkers Shortbread For Sponsoring This Week’s Giveaway! 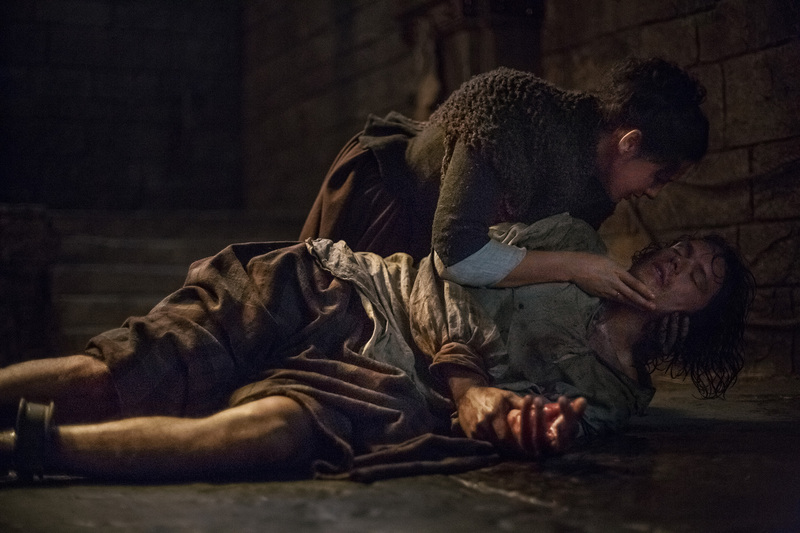 Claire must work hard to heal Jamie and bring him back from the darkness. Do NOT touch my breasts when saying Goodbye! 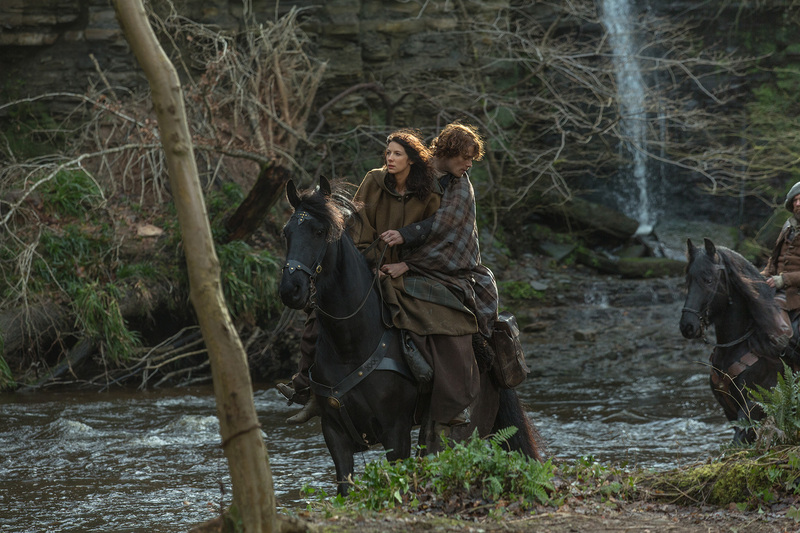 Jamie and Claire off to the next chapter of their lives! #Droughtlander Begins! And to our Outlander BluRay WINNER! Thank you ALL for watching OutlandDish! 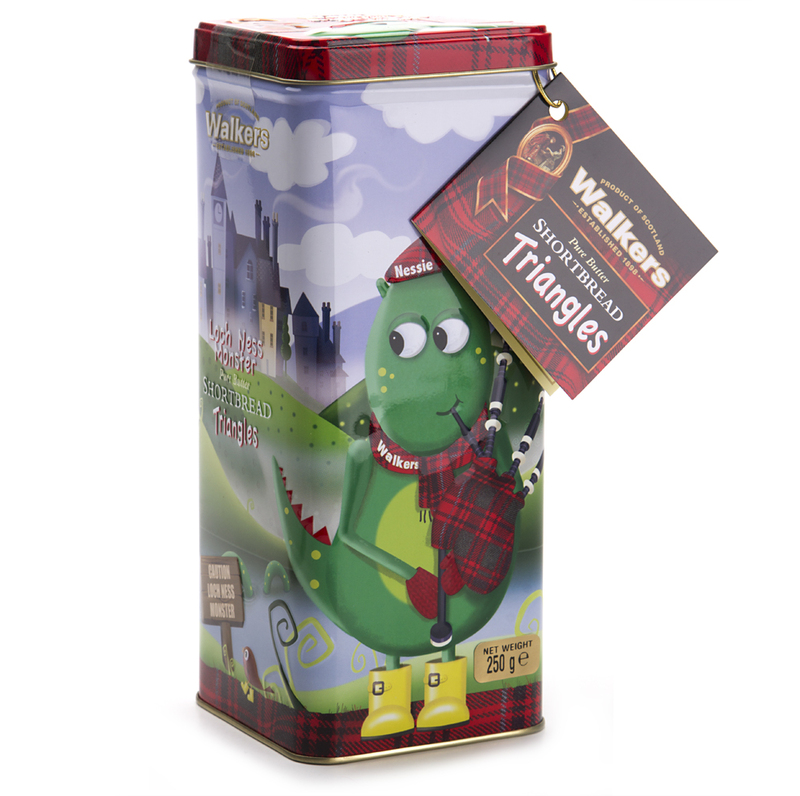 Thank You To Walkers Shortbread For Sponsoring These OutlandDish Giveaway! What the OutlandDish fans are saying! 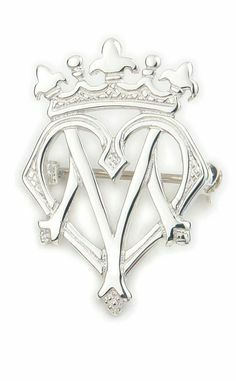 @AnglophileTV You ladies have built trust with us. The thing I loved abt ep 16: you relieved the stress with fun and respect for the work. @AnglophileTV You come across as true fans of the show with respect for actors, crew and the story.Your lighthearted approach is a plus! You two could ‘Dish’ the Oxford Dictionary A to Z and keep me enthralled and laughing. Can’t wait to see what you ‘Dish’ up next! Another great recap ladies – it had me crying again. How will we get through the Droughtlander without you? I hope you’ll be able to do some Droughtlander specials to give us a much needed Outlander fix in the long months ahead. The episode we’ve all been dreading: Wentworth! A visit from Black Jack causes Jamie to realize a fate exists that is worse than his death sentence. When Jamie’s hurt…we hurt. Thankfully Claire comes to his rescue! How much do we hate Slack Jack Randall? Featuring Interview with Graham McTavish! PLUS a BONUS song by the OutlandDish Girls! 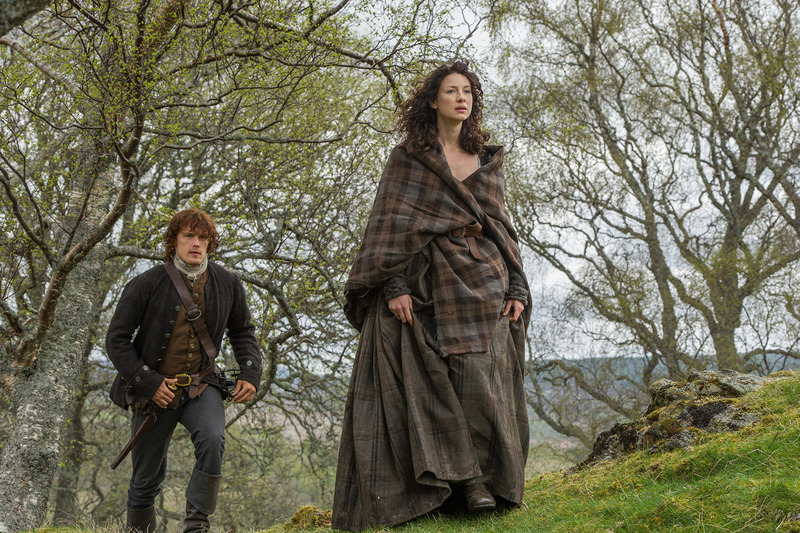 Claire and Jenny set out to rescue Jamie from his redcoat captors! 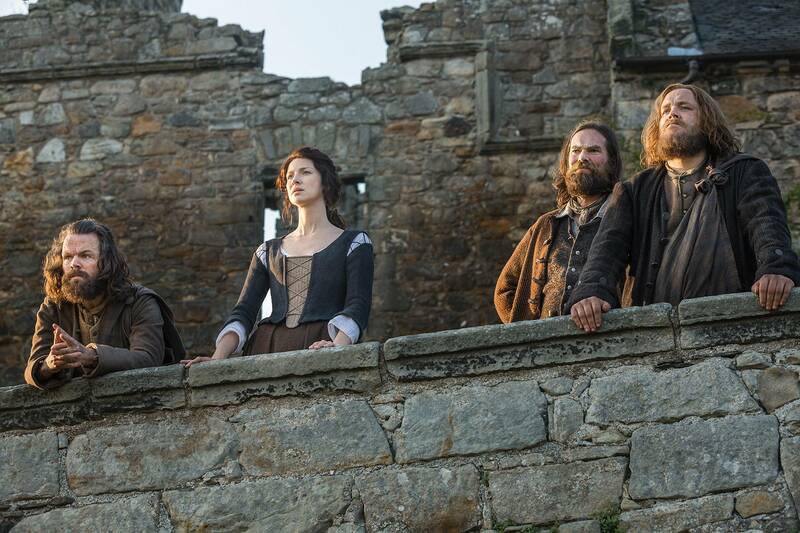 When Murtagh joins the search some undiscovered talents are revealed. Murtagh and Claire have hidden talents! 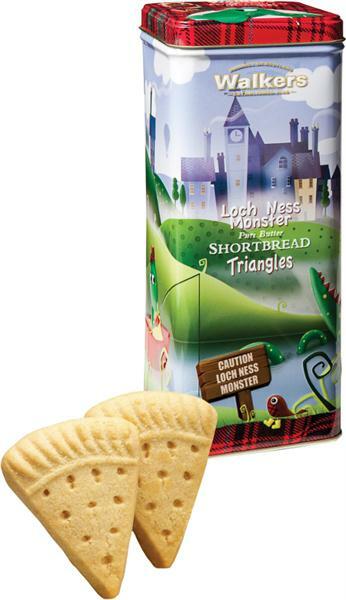 WIN this adorable Walkers Shortbread Biscuit Tin featuring the Loch Ness Monster! Featuring Interview with Tobias Menzies! 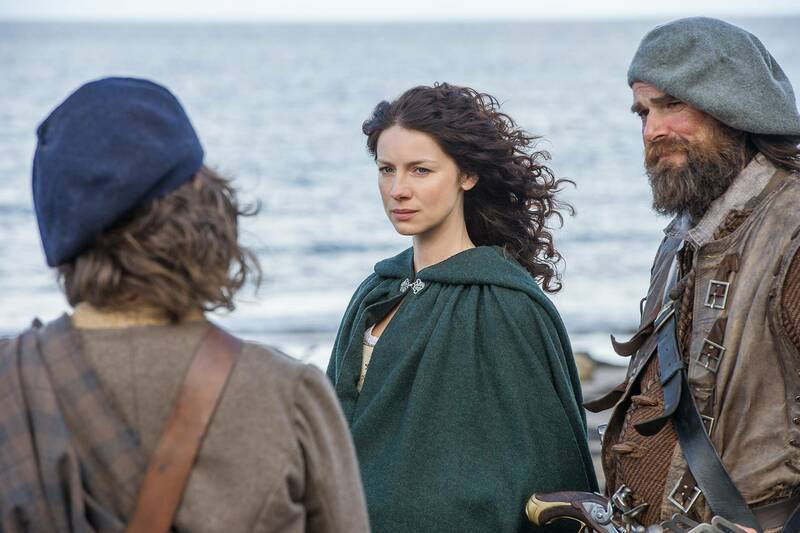 A Redcoat deserter from Jamie’s past returns; Jenny goes into labor; Jamie and Ian join the Watch. Featuring Interview with Lotte Verbeek! 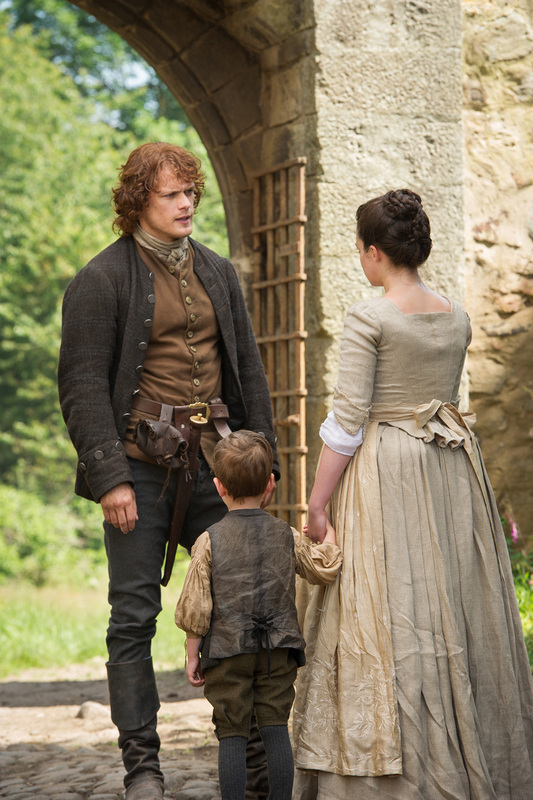 Jamie returns home to Lallybroch where old wounds are opened and new discoveries made! His Laird of Lallybroch, he’s got a big ‘ol c***, he’s the Boogie Woogie Scottish Boy! Did she just call Claire a trollop? Featuring Interview with Outlander Author, Diana Gabaldon! 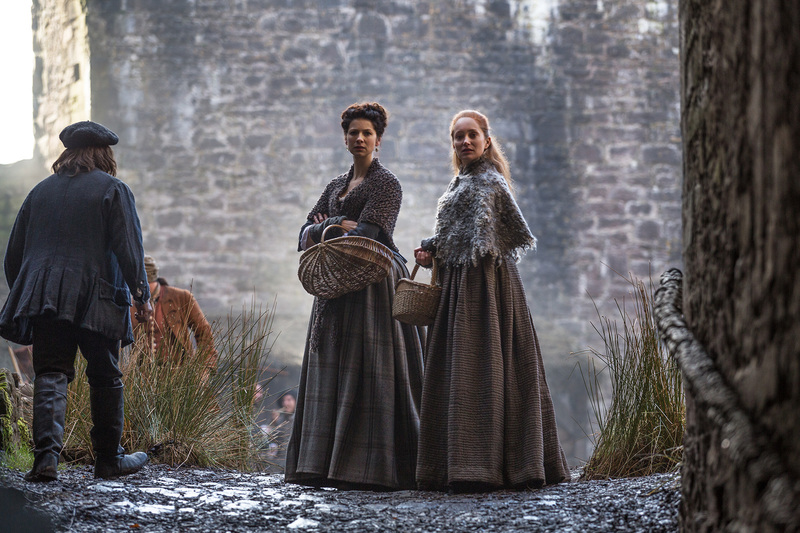 Claire and Geillis stand trial for witchcraft; Claire learns a secret about Geillis’ past. After the wedding episode, The Devil’s Mark was one of our absolute favorites. 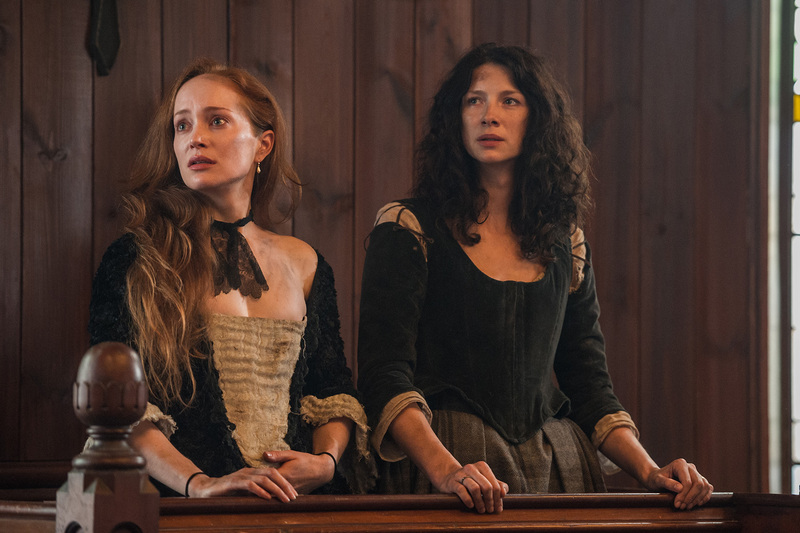 Lotte Verbeek and Caitriona Balfe knocked it out of the park as two women on trial for witchcraft. Brilliant and chilling performances! Geillis and Claire on trial for witchcraft! 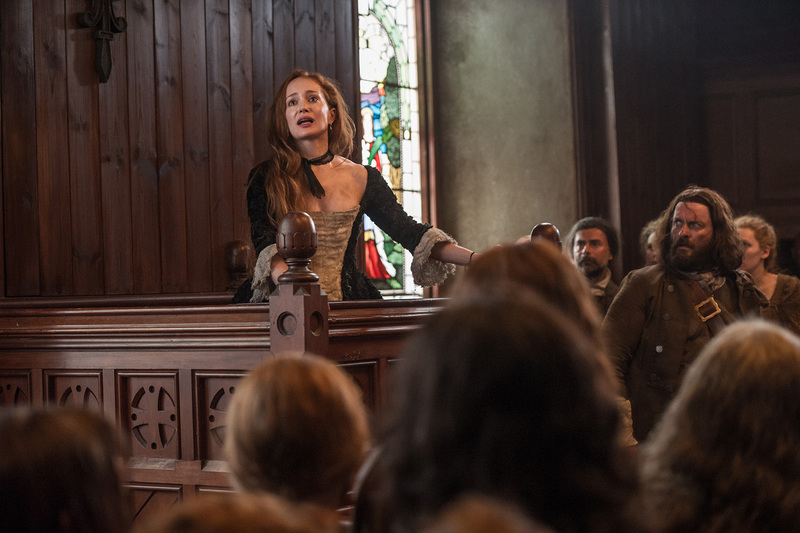 Brilliant performance by Lotte Verbeek in this episode with a story that echoed of The Crucible. 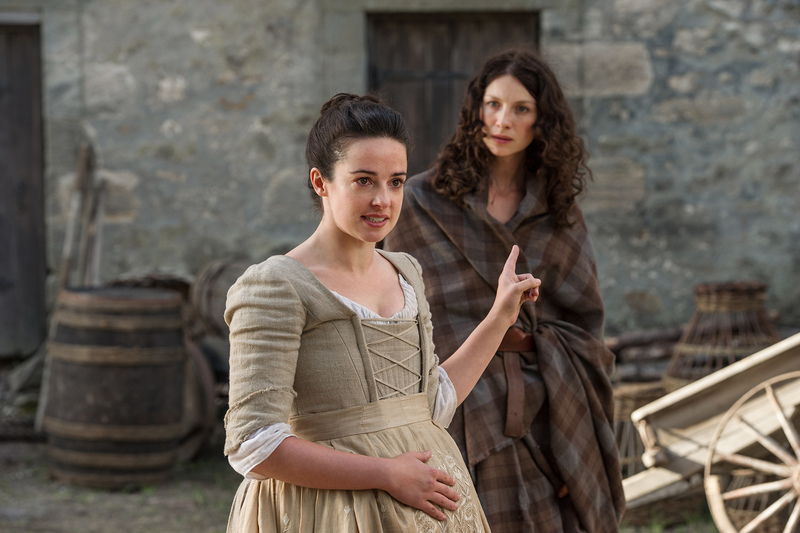 Claire prepares to tell Jamie ALL OF IT! Great scene! Featuring Interview with Caitriona Balfe PLUS New Giveaway! 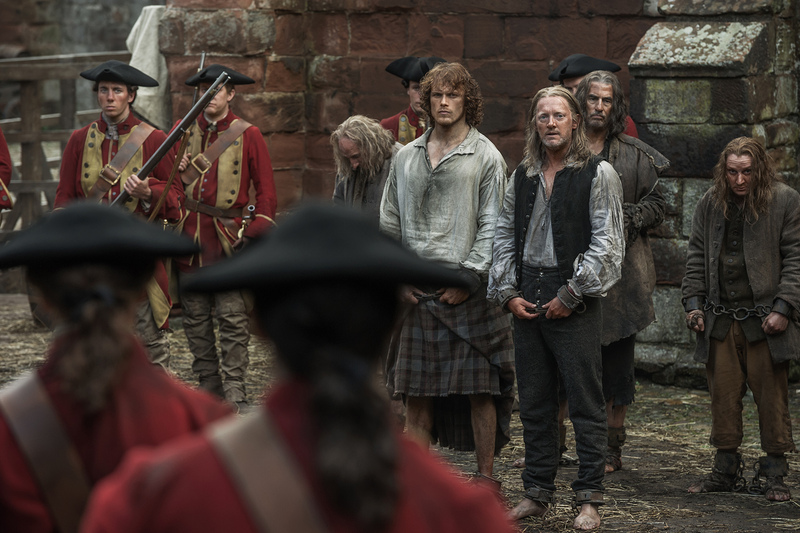 The Duke of Sandringham arrives at Castle Leoch and Jamie sees it as his opportunity to clear his name. Geillis is hiding a secret. 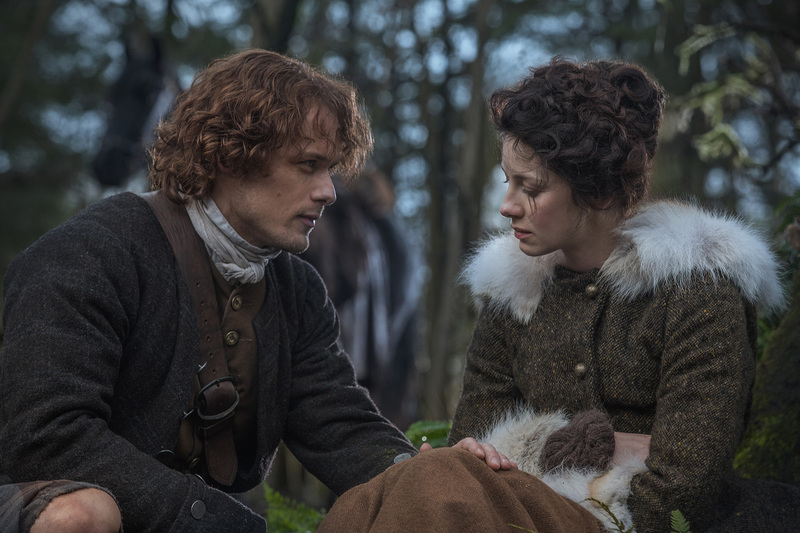 Jamie and Claire grow ever closer, if that’s possible. When was the last time we heard her say, “I must return to the stones at Craig na Dun”? 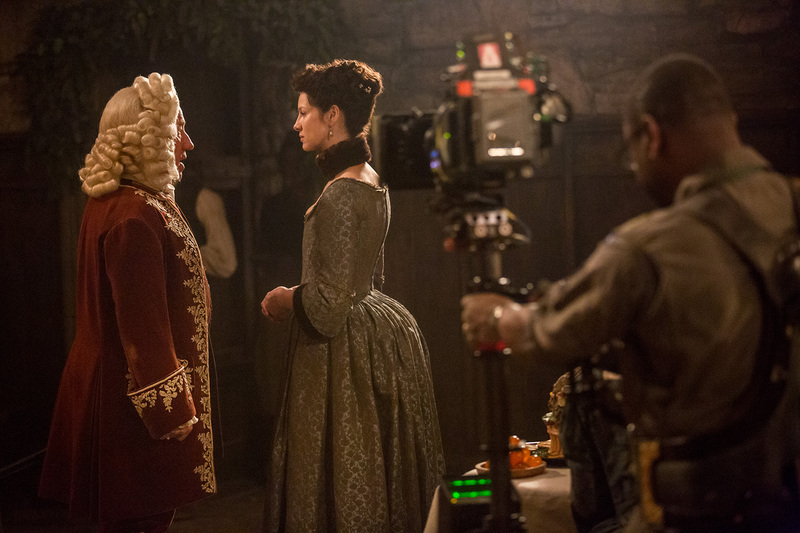 Claire shows she’s a woman to be reckoned with as she negotiates with the Duke of Sandringham! Geillis is a mysterious thing…what do we think she’s hiding? 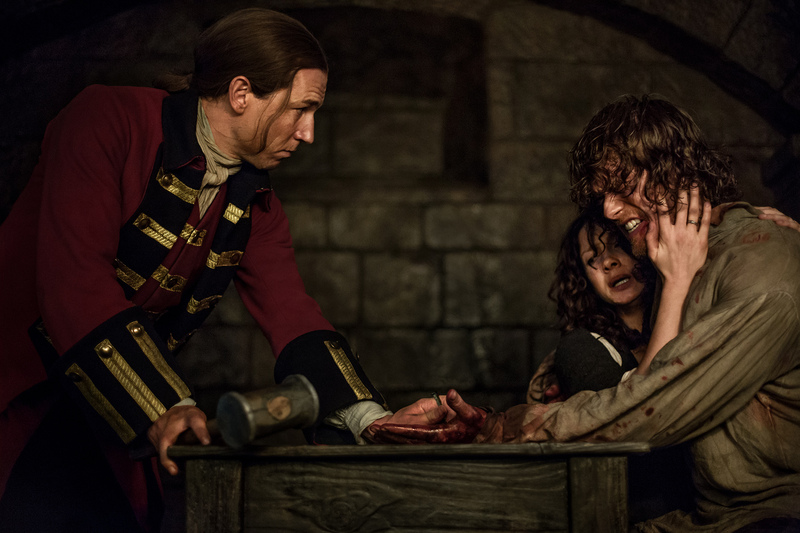 Jamie and the Highlanders rescue Claire from Black Jack Randall. It’s the Tartan Tart! Eerie Laoghaire…what is she up to? 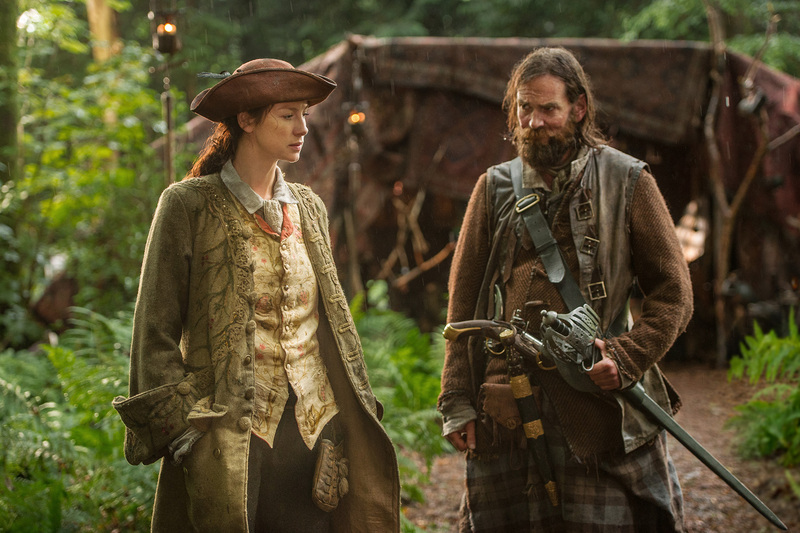 Our recap of the FIRST part of the hit ground-breaking series from Starz, Outlander! From Jamie and Frank Randall‘s second honeymoon trip to Inverness to Claire’s mysterious journey through the standing stones at Craigh na Dun which lands her smack dab in the middle of 18th Century Scotland and in the arms of the gorgeous Highlander, Jamie Fraser! Join us as we relive our favorite moments of Season One, Part One before Droughtlander became part of our everyday vernacular! Jamie Fraser and Claire Beauchamp Randall. The 18th Century couple that have captured our hearts~! Frank and Claire Randall get reacquainted. Enjoy it kids, it doesn’t last long. Claire will never look at this face the same way again. The moment that changed Claire’s life forever. Enter Hunky Jamie. Frank Who? So…it’s not hard to figure out what our favorite episode was from the first part of Season One! Are we all in agreement over the WEDDING EPISODE? Oh yeah! Bonus Interivews with Sam, Cait, Lotte and Ron! The one where Sam and Cait accept TAC’s Favorite British Artist Awards! Thank you once again to ALL the Outlander fans who have supported The Anglophile Channel’s OutlandDish recap series and blog. We have loved meeting you at the various OutlandDish events!! See ya around the Highlands! 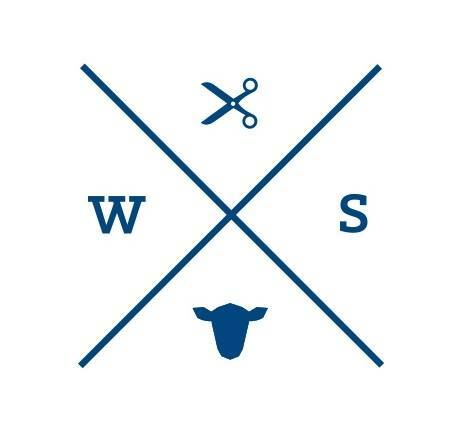 COMING SOON our OutlandDish Newsletter and Mailing List! Join us and your name will be entered for ALL future OutlandDish giveaways! Marlise & Elyse, Your OutlandDish Hosts! Starz and related channels and services marks are the property of Starz Entertainment, LLC. Outlander © 2014 Sony Pictures Television Inc. All Rights Reserved. 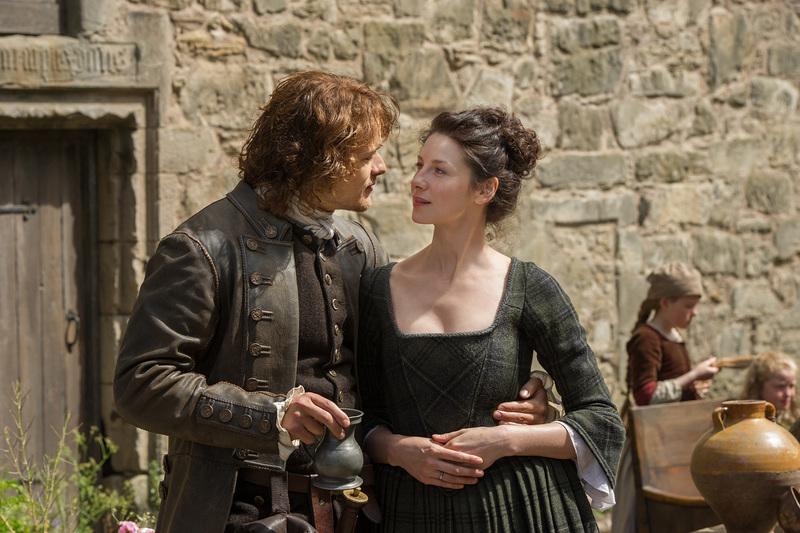 10 Responses to OutlandDish© A Wee Recap Show! You lassies did a wonderful job reviewing episodes 1-8. Looking forward to your review of The Reckoning! Love both of your recaps. You ladies are a hoot! Just discovered your entertaining and insightful site, love it! You two are fabulous and these recap shows are so much fun. I look forward to seeing each installment, it is like a visit with my best girlfriends Keep up the great work. Your efforts are so appreciated by this Outlander fan So nice to have met you at the The Grove yesterday. I am a show watcher also, Marlise. Will read the book after season 1 has finished. I learned about your site when I met you ladies at the “Outlander” costume unveiling this past Friday. Love your site — you ladies are so delightful to watch. What fun! Was also looking for what you filmed on Friday, is it posted yet? Where have I been? I just discovered your OutlandDish show and love it! You two are so much fun! Thank you. I just happened across this page and I loved your recap of episode 10! Can’t wait to watch the next!